In these cycles , there are usually six concerts within two weeks in one of the most beautiful concert halls in Vienna, the Salvator Hall in Mariahilf (Barnabitengasse 14, 1060 Vienna, next to Haydn Church). The hall is easyly accessible with U3 subway, but also parking garages are located nearby. 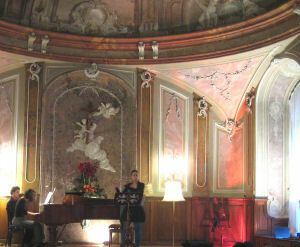 The picture shows our Hungarian trio of March 2, 2010 rehearsing on February 28 at the Salvator Hall. Previously held concerts can be found in our concert archive (sorry; in German only, but many pictures and full programs). All concerts of these cycles are held with our mahogany - grand piano. This perfectly restored piano, 220 cm long, with repetition action and sostenuto (third) pedal, was built under Ludwig Bösendorfer in 1908, and is definitely noticable: It is of unique quality in ease of playing and sound. Our musicians prefer it to any other piano! The very best graduates and students of recent years (many already "in business ", for example with the Philharmonic or Symphony Orchestras, at State Opera or Volksoper) as well as teachers of music at the university and the conservatory. In addition to these cycles, we also occasionally offer concerts without modern piano, for example with early music, string chamber music or fortepiano. There is not enough room for all the superlatives: Look, what has taken place there already in our archive . Tickets for these concerts can be purchased here. Please make reservation and pick them up at the box office. Admission without reservation only if seats are available; experience shows this is usually the case. During intermission hot drinks, Vöslauer mineral water and snacks will be provided! Free choice of seats - come in time; if possible, make reservation in advance! All concerts begin at 19:30. 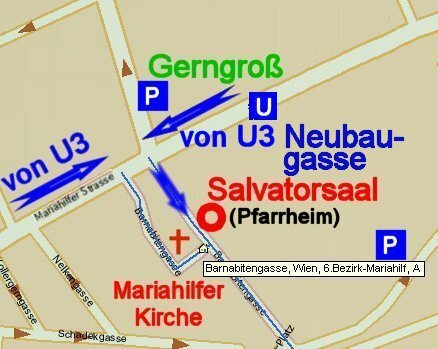 All this in the heart of Vienna - Salvator Hall, Barnabitengasse 14, 1060 Vienna, next to Mariahilfer Church (Haydn Church, situated opposite of Gerngroß department store ! Easily accessible via U3; car parking facilities within 100 m distance! Discounts: Ö1-Club 20%, children, pupils and students 50%; families: children's price for all.